Authentic NATURE STONE® Brand Flooring's specially formulated, proprietary epoxy is the secret to its beauty, performance and longevity. 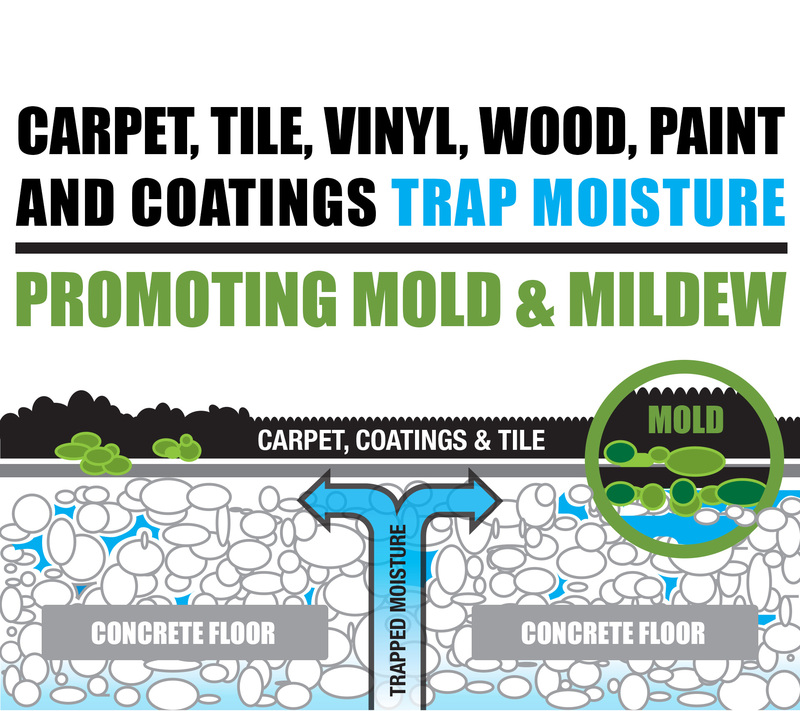 Carpeting, wood, tile, paint and vinyl don’t allow concrete to breathe naturally and can trap moisture between the concrete and the underside of the floor covering, causing mold and mildew which promotes unhealthy air quality not only in your basement but throughout your entire home. Eventually the flooring will need to be replaced. However, Authentic NATURE STONE® Brand Flooring allows moisture to continuously evaporate because of the intentional HYDROSTATIC PORTS® Technology evaporation openings formed into the flooring during installation. The result is a permanent floor covering that will never need to be replaced and will resist the growth of mold and mildew even in damp or wet conditions. Water migrates upward from the ground through the concrete floor, becoming trapped beneath floor coverings. Nature Stone® brand flooring makes for a healthier home by preventing the growth of mold usually found beneath carpet, tile, vinyl and wood. Not all stone and epoxy mixtures provide the same level of performance over concrete. For a beautiful floor that eliminates concrete problems permanently, Authentic NATURE STONE® Brand Flooring uses a blend of the finest natural stones and specially formulated, proprietary epoxy developed by and used exclusively by Authentic NATURE STONE® Brand Flooring. The strength of the epoxy is enhanced by a proven stone-to-epoxy mix ratio developed by Authentic NATURE STONE® Brand Flooring. 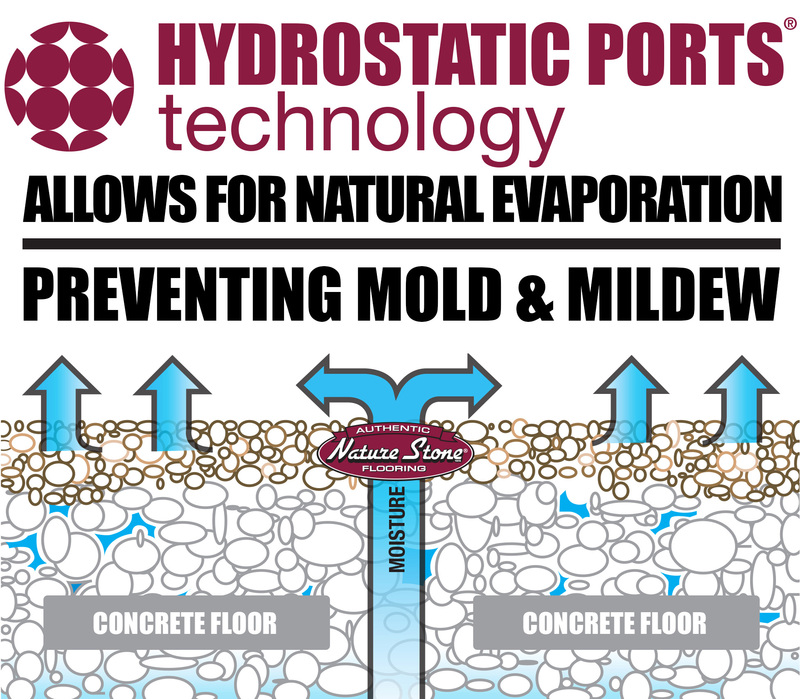 This combination creates HYDROSTATIC PORTS® Technology that permits concrete to breathe naturally, preventing the growth of mold and mildew by allowing moisture to evaporate thus promoting clean, healthier air in your home. The key to our HYDROSTATIC PORTS® Technology is our specially formulated, proprietary epoxy and proper epoxy-to-stone mix ratio. Below are samples of the underside of improperly mixed stone and epoxy flooring with inferior formulated epoxy, next to Authentic NATURE STONE® Brand Flooring with our specially formulated, proprietary epoxy and a proper mix ratio of stone and epoxy.